Irish Triskelions from Book of Durrow. Here is a site not only with color (colour) pages, but with the source of the knot design. 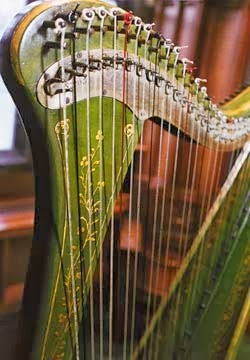 Some researchers believe the Irish harp was the first to be developed. O' Carolan was a blind, itinerant harpist from the 16th century who would play for his keep--playing original music every sunrise and bedtime.